Researchers monitoring radiation from the Fukushima Daiichi nuclear plant is finding a larger number of sites off the West Coast of the United States that are showing signs of contamination from the plant, it has been reported this week. The Fukushima plant was severely damaged during the March 2011 earthquake that rocked Japan, causing three nuclear meltdowns and the release of radioactive materials, including cesium-134 and cesium-137. 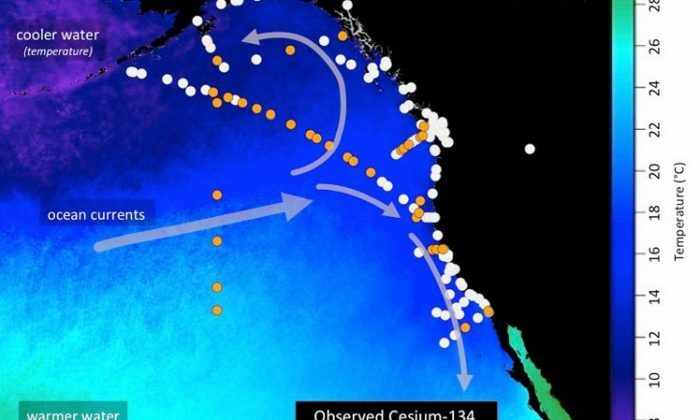 According to the Woods Hole Oceanographic Institution, higher levels of radiation from the nuclear disaster are showing up in he Pacific Ocean off the West Coast, and an increasing number of sampling sites have seen signs of contamination. Ken Buesseler, the WHOI scientist who was the first scientist to star monitoring the radiation following the accident, said the new findings are notable. “First, despite the fact that the levels of contamination off our shores remain well below government-established safety limits for human health or to marine life, the changing values underscore the need to more closely monitor contamination levels across the Pacific,” he said. Researchers began to monitor the radiation in the Pacific about three months after the disaster. They enlisted the help of citizen scientists to gather samples and then used sophisticated sensors to look for radioactivity from Fukushima. Most seawater sample from the Pacific Ocean is sure to have cesium-137, which is an isotope with a 30-year-long half-life, as some of it is left from nuclear testing in the Pacific. However, the cesium-134 isotope is likely from Fukushima and has a two-year half-life. “Levels today off Japan are thousands of times lower than during the peak releases in 2011. That said, finding values that are still elevated off Fukushima confirms that there is continued release from the plant,” added Buesseler.